It’s already very obvious that invitations are essential not only for weddings but also for other events, most especially formal ones. 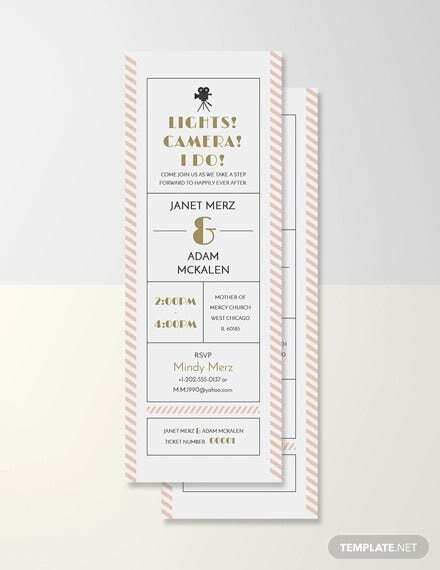 Invitation designs act to formally inform individuals regarding an event and telling them that they are actually expected to come to that event. With RSVPs, they are intended to be used for responding to the invitations, informing the host whether they will be able to make it to the event or not. You may also see invitation Ticket examples. 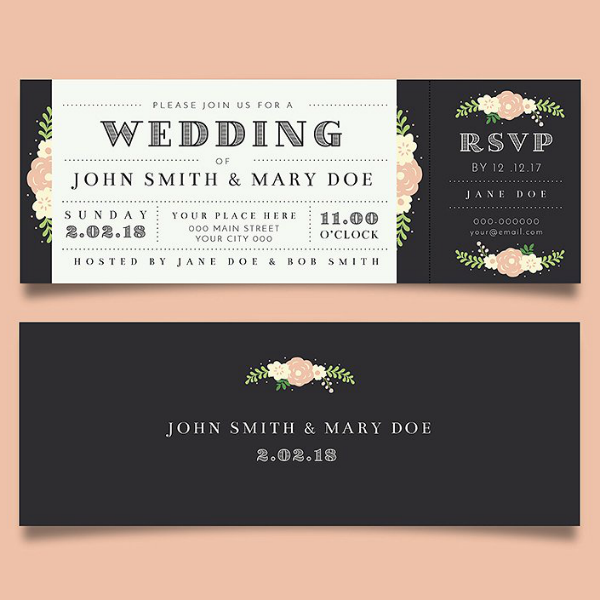 The use of simple invitation designs and RSVPs is highly important for any event since it provides the invitee with what they need to know such as the date and time, and the location where the event is to be held. Other than that, the RSVP can help the host to determine the confirmed number of people who will be coming to the event. Allowing them to make adjustments regarding the accommodation. In this article, we will be showing you wedding invitation cards, unlike anything that you’ve ever seen before. 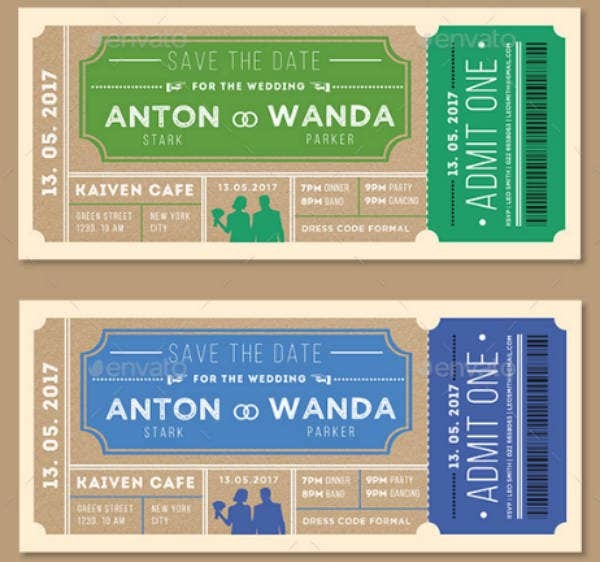 These wedding invitation templates resemble tickets complete with a detachable stub intended for the RSVP card. 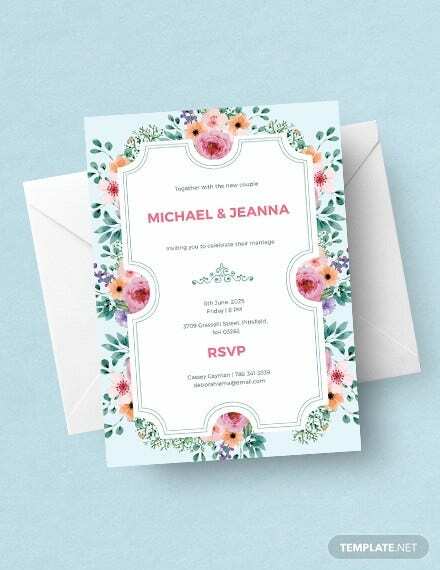 There are around fifteen invitation ticket templates below that you can choose from, and these templates can be downloaded for a very reasonable price, go ahead and check them out. 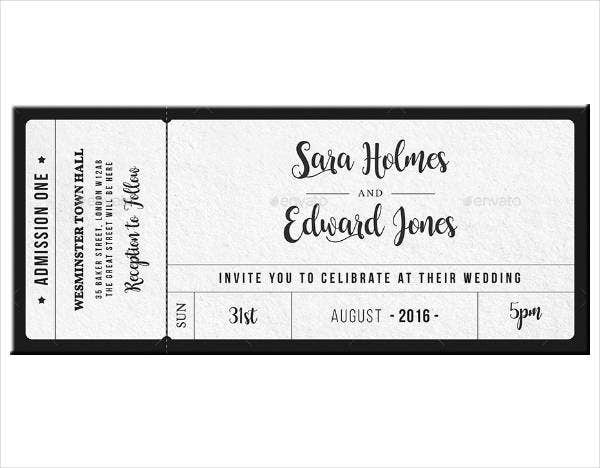 To start this article rolling, here is a ticket invitation template that you can use for a fun, less formal, and more casual wedding ceremonies. From the design of this template alone, the choice of colors and font used will easily give the invitees an idea as to the tone of the wedding. When you download this template, you will be getting not only one but a total of three PSD files. Additionally, you can also choose from among three vibrant colors to use for this template—pink, yellow, and sherbet orange. 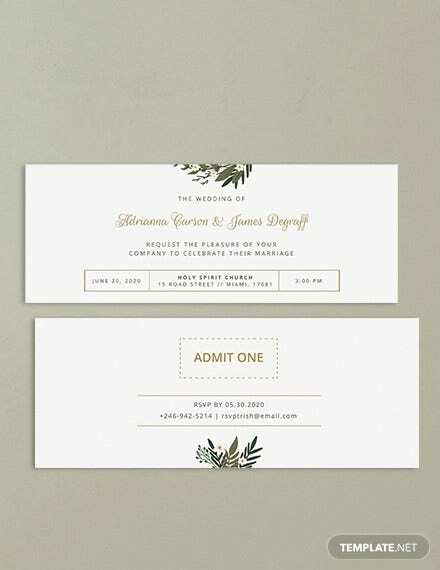 In contrast with the last wedding ticket template that you have just seen, this one leans more towards formality and is a perfect choice for those lookinhttps://www.template.net/design-templates/invitation-templates/wedding-invitation/g for an artistic yet elegant design for their simple wedding invitation tickets. For a reasonable price of only $7.00, you’ll be getting a well organized layered PSD file, and two color options to choose from. And, aside from just the wedding invitation, this template also comes with an RSVP attached to the same card that can be detached when used. 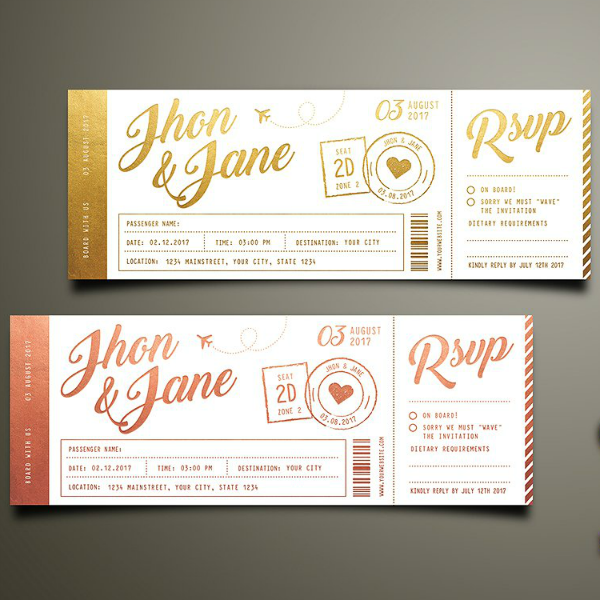 Here’s a simple and typographic wedding invitation ticket template that will surely turn people’s heads when they see it. 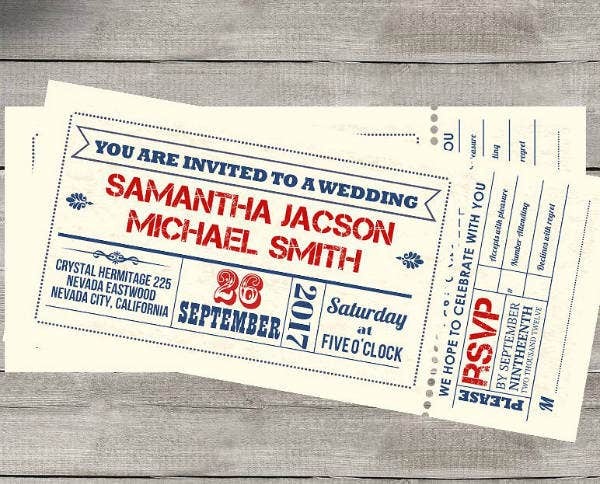 Even with its simplicity, you’ll never find traditional wedding invitations as unique as this one. 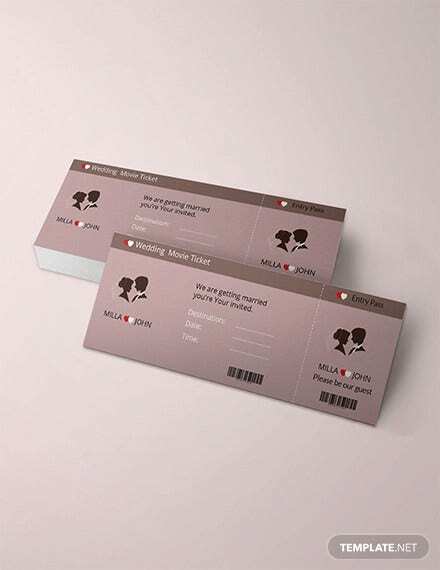 The contents of this ticket template are very well-organized and are divided into different sections with a line, the ticket itself is very easy to read. And just like the previous template that you have just seen, the right-hand edge of the ticket is detachable and is intended for the RSVP. 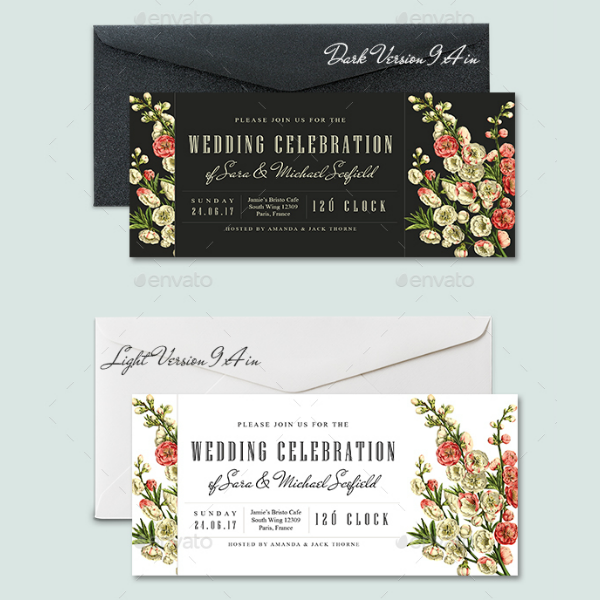 Do you want your elegant wedding invitation ticket to look like a vintage-styled newspaper or something that’s been printed during the previous generation? Well, you’ll be glad to see that we may have something relatively close to what you might be looking for. 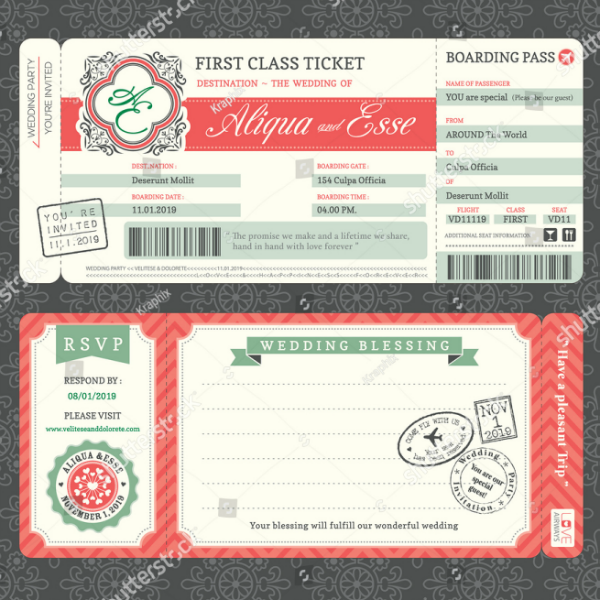 Check out the ticket template above, the left and larger section of the template is where you can find the details about the wedding including the name of the to-be-wedded couple, the date and time of the wedding ceremony, and the venue. On the right side of the ticket is the RSVP, which can be torn off from the card so that the invitee can send it back to the host while still keeping the remaining half of the invitation ticket. What’s the motif of the wedding? 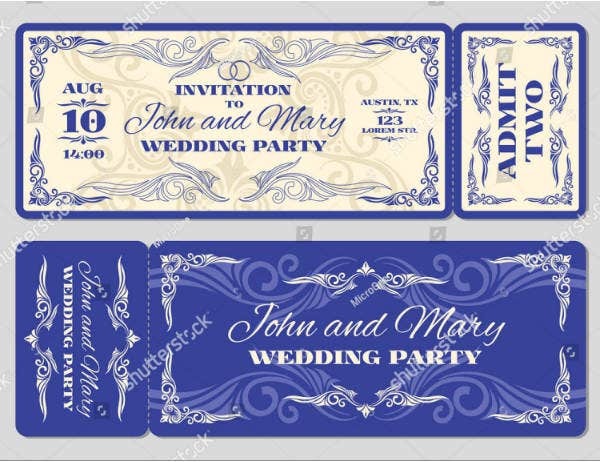 If it is going to be blue, then the ticket template shown above would probably be the perfect choice because of the color scheme used on it. The wonderful thing about this template is its use of ornate graphics around the edges, which adds to the elegance of the design. If you choose to download and use this template, then you will be getting a design not only for the front side of the ticket, but also for its opposite side as well. 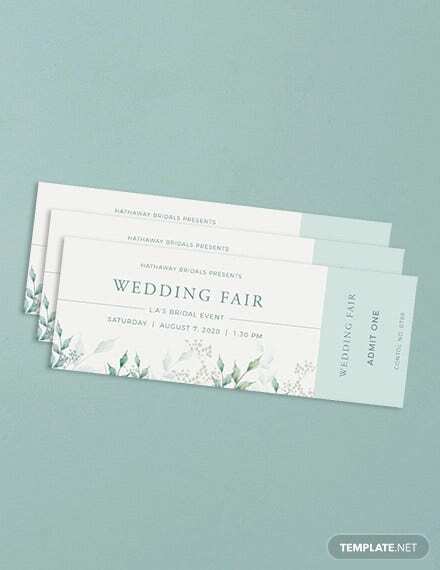 Here is another minimalist yet formal wedding invitation ticket template that you may also want to consider using regardless of the wedding’s motif. One of the most notable features of the design on this template is its thick bezels, which is just thick enough that it creates a clean frame around the design and not to thick that it overshadows the more relevant features. In order to create something that contrasts with those bezels, the entire design mostly consists of textual elements written over a subtly textured white background. 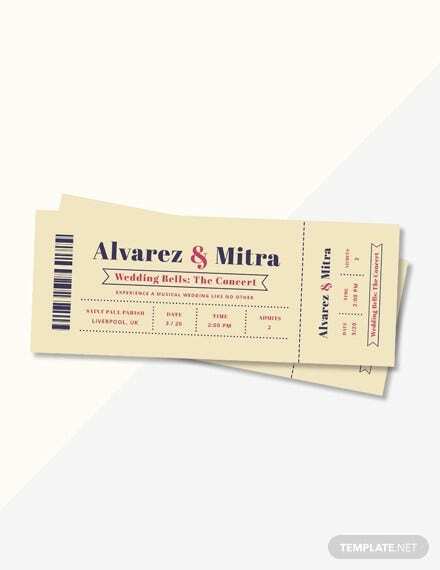 Want to go for a flashier, more creative look for your wedding ticket invitation? 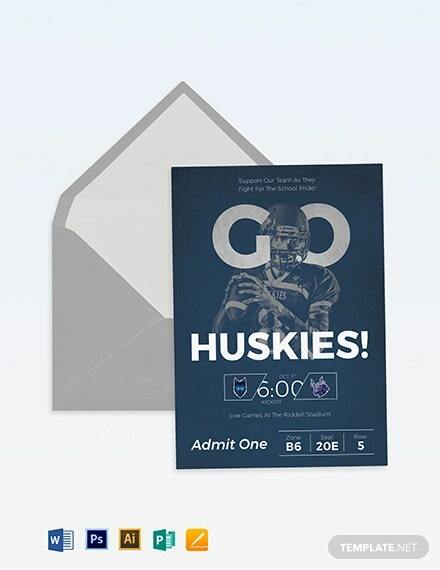 Take a peek at the ticket design template above, you have two color variations to choose from. When you download this template, you will be getting two PSD, two AI, and two EPS files, for a total of around six files. In order to edit these templates without much hassle, you need to have Adobe’s Photoshop and Illustrator installed on your computer—Photoshop for PSD and Illustrator for both AI and EPS. 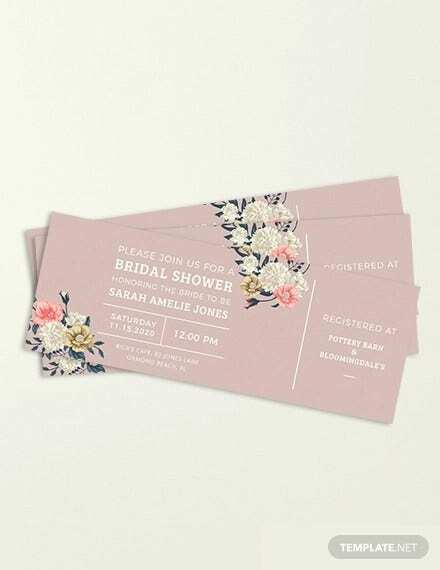 While the RSVP on this template is still attached to the entire ticket, it is unlike the other templates that it can simply be torn off, you will need to cut it using scissors. Here is a PSD ticket template that you might want to consider using if you are looking for something less formal and more “colorful”. Speaking of colorful, this template comes with only one PSD file but a total of six alternative colors to choose from. Whatever motif you have in mind for the wedding, this template is likely to have the color that you need. 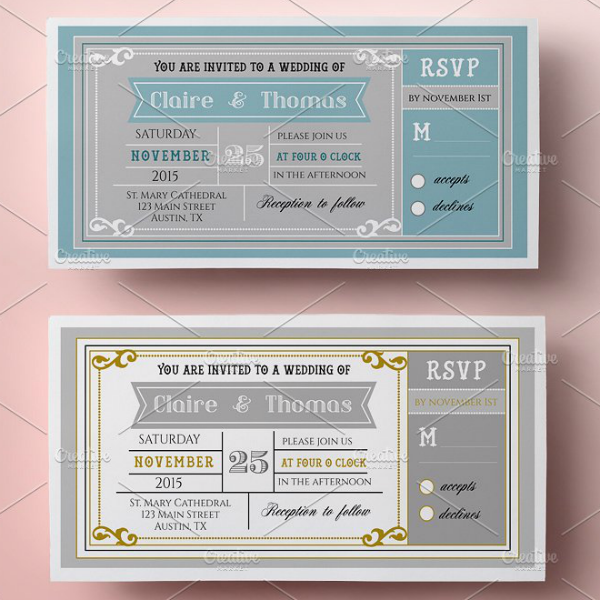 If you have noticed from all the sample invitation ticket templates that you have seen so far, most of them had solid colors for their backgrounds. 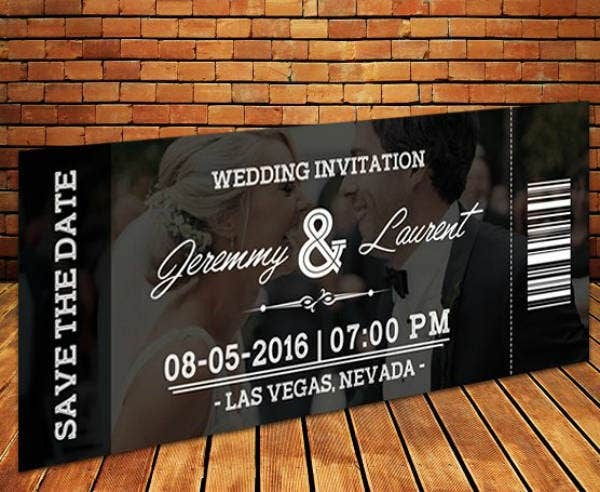 Now, let’s it up a notch with this beautifully romantic invitation ticket template. This ticket template doesn’t come with a solid-colored background, it actually allows you to use an image for it. 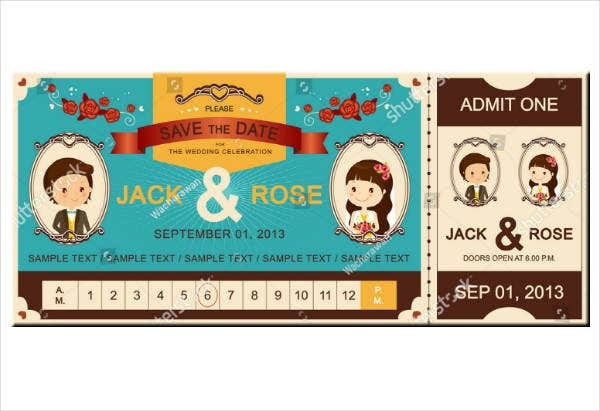 So get those pre-nuptial photos ready and incorporate them on the background of the invitation ticket. And if you can notice, there is no RSVP card present on this ticket. 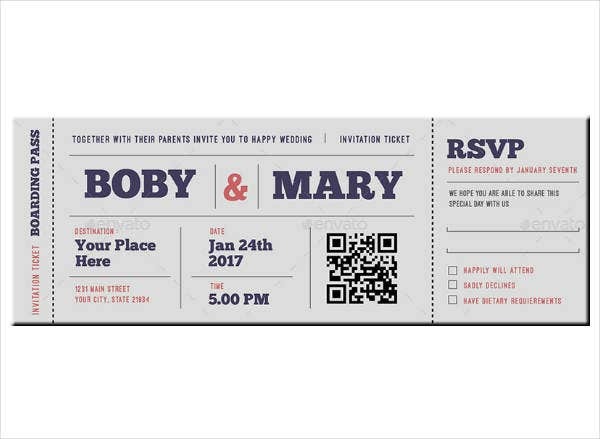 Actually, you may take advantage of the barcode on the right-hand edge of the design and use it for a digitized version of the RSVP. 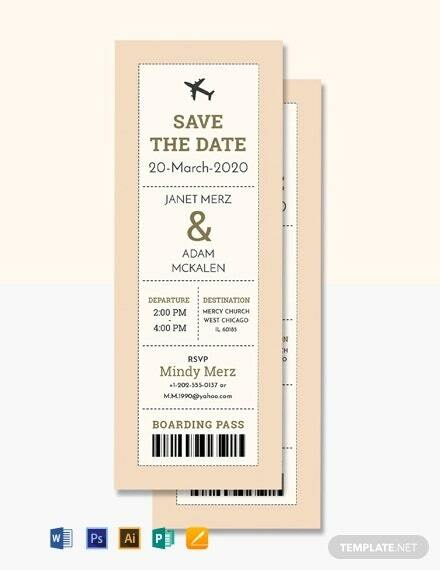 Here is an adorable wedding ticket template sample that you might want to use for the wedding. This template has a little bit of both cuteness and formality thrown in to the design. The way the elements are being presented and the choice of text and graphics contribute to its formality, while the choice of colors and character illustrations balance the tone. Then again, this template is easily editable, meaning you may be able to use your own portrait images instead of those illustrations. 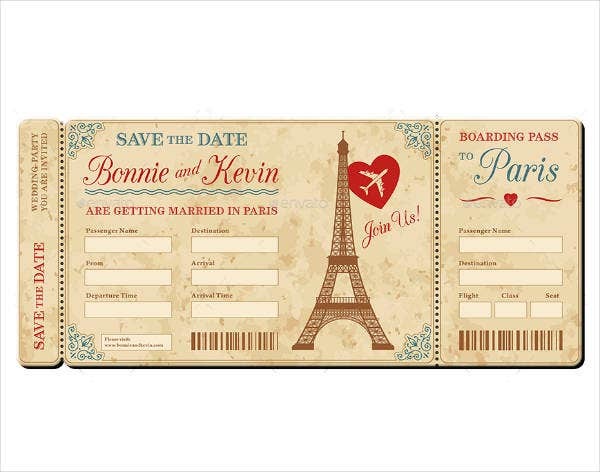 You don’t necessarily have to be married in Paris to be able to use this banquet ticket template. Let’s just say that you love the place so much because of its reputation being the “City of Love”. The awesome thing about this ticket template is it actually resembles a genuine boarding pass ticket. This template also comes with a design for the back side of the ticket, which is where the Wedding Blessings and other information regarding the wedding are being listed down. Now, let’s go back to the clean and more elegant themes for wedding invitation tickets with this template. You may notice that this template is almost exclusively textual, with the exception of a few flower illustrations thrown here and there. Also, this template embraces white space, which actually adds to the cleanliness and formality of this template. Lastly, you can download this template in two formats: PSD and AI, so be sure to have Photoshop and Illustrator installed on your system. Here’s a template that you will never see outside of GraphicRiver, so make sure not to hesitate if you’re into the design on this template. This template will only cost you $6.00, and comes with five high-quality PSD files (invitation ticket and RSVP), five alternative colors to choose from, and a free font. 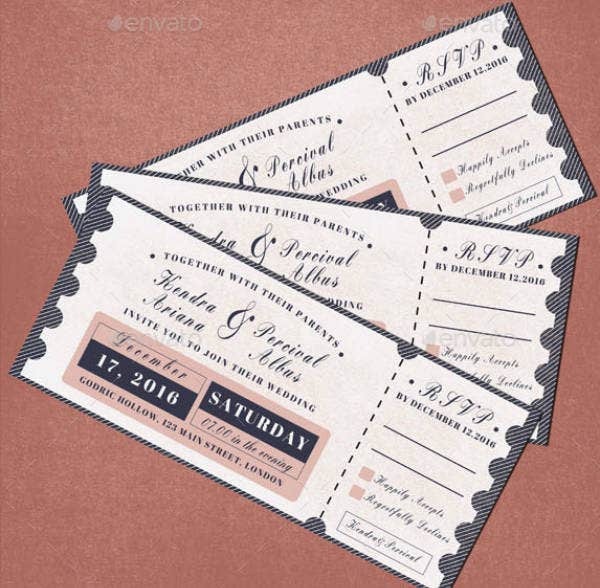 Check out this impressively artistic wedding invitation ticket template, and download it right away if you think it perfectly fits what you are looking for. Here is another ticket invitation template that remotely resembles an actual plane boarding ticket, but with a touch of creativeness for an entirely fresh look. But the theme of this template is not the only feature that makes it worth downloading, the color scheme makes it a perfect choice as well. The colors on this template fits why weddings and marriages exist in the first place, because of love, and we already know that the color red is commonly associated with that emotion. You can also like movie ticket templates. 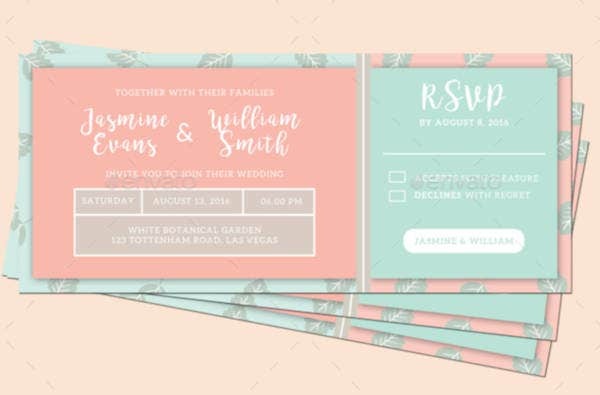 And for the last template in this article, a PSD-based floral wedding ticket invitation template. As you can see from the template above, the textual elements are all written over a solid background which can either be light or dark. On the sides of the template are flower illustrations to add to the beauty of the design. As mentioned earlier, this template comes in two background colors, but with a total of seven PSD files compressed inside one ZIP file.